﻿ Cute ♥ Sweet Pinky Love Texts! Cute ♥ Sweet Pinky Love Texts! Cute & Sweet Pinky Love Texts – Largest Offline Collection of cute and sweet texts and Love messages!!! Cute and sweet love messages, poetry texts & love quotes for your girlfriend, boyfriend, wife, for husband, mom, sweety pie…a secret lover of sixteen. Never run out of tender love words to write in your greeting cards again for him or her. Your text message maker for any/all day. Pink keyboard, pink wallpaper, pink digital pad, pink skins, pink texting themes…the list of my favorite pink mobile apps goes on. Pink is the color of the day! So why not a Pinky Love messages collection apps for android? Time for Pink out, guys..pink is no more just girly! The messaging visual color theme of this app is pink and black – pinky backgrounds and black fonts. Pink on phone rocks! – Once downloaded, no need of internet connection to view text messages. Totally offline application. – App can be moved to SD card. Cute pink icon. – Send and share via SMS, text message, Twitter or Facebook twitter, facebook, whatsapp, viber, gmail, sms application, etc. Also add your own comment on msgs. – Weekly auto update of text messages. Discard all your diary, journal, notes and cards where u used to write down ur good sms text messages. Cute & Sweet Pink o Love SMS book has all the sweet and spicy words, miss you poems, emotions and pickup lines for messaging everyone in the nation. Find the right tender love words & perfect phrases to personalize your greeting cards, or SMS/Email these cute and sweet good morning / good night messages to your girly, mom, friends n family. So get addiction for texting with an eye for pink! Its a cute XMS app for girls and boys. We’ve collected 1000s of sweet talk texts, cute love & romance quotes, sweet tender sayings, cute jokes, card messages for love, sayings and quotes, pickup lines, cute poems, etc; and designed this messenger for android with pink theme text backgrounds. Wisdom words of kindness & forgiveness in english, hindi, punjabi and a few in tamil. Stop dreaming & express the untold emotions to your dream sweet heart with our Cute & Sweet Pinky Love Texts! 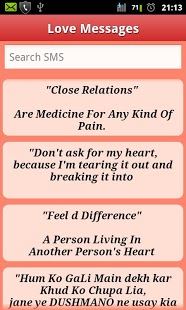 Great text ideas & words to spice up your love life.